Posted on 15 November 2010. As happened in the sacred water Tirta gangga Palace, a road will lead you to win Tirta Ayu sumptuous restaurant. Tirta Ayu Restaurant is part of the sanctuary of rest, the last king of Karangasem, where the sacred spring water flows from the fountain and lily pond, and finally the panoramic rice fields. Tirta Ayu Restaurant is elevated to enjoy the spectacular views and magnificent royal garden. Once you arrive, you know you’ve reached the threshold between Bali and internationally. The menu offers a mix of dishes to stimulate the taste buds. Enjoy a wide selection of dishes ranging from simple selected European, Indonesia Bali famous specialties. It’s paradise to enjoy the mouth watering culinary delights Tirta Ayu. Tirta Ayu Restaurant delights every guest with a real dinner. We specialize in creative cuisine, exotic Indonesian and European history in a royal palace. Tirtagangga overlooking the Water Palace, Tirta Ayu Restaurant is the perfect place for a unique dining experience. Inspired by the cuisine of the King, we strive to achieve best quality and fresh foods found on the island of Bali, cooked to perfection with the finest ingredients and spices from Bali’s world. 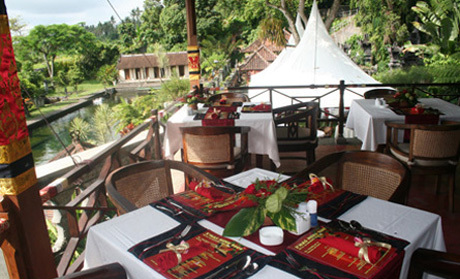 Bali Rijstafel is served in the traditional palace called INGKA. Jingga Safriani chicken – chicken grilled wild young man with a tantalizing flavor to curry. Bebek Betutu – Steam and duck roasted with Balinese spice served with rice and vegetables. (Also available Betutu chicken). Menus and the experts chosen are coordinated by our team who also deal with special requirements.